6 Jan. 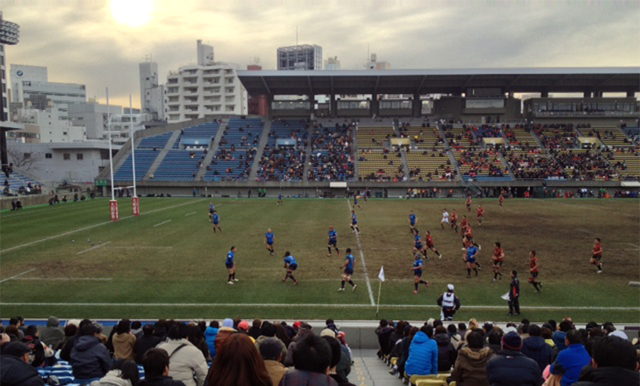 The Japan Rugby Top League kicked off again for 2013 with a double feature at the excellent Chichibu Stadium, and the Cru was there in the stands making more noise than the other 5,000 spectators together. Ricoh Black Rams, featuring Riki Flutey, took on Yamaha Jubilo with Jerry Collins on the team and a final score of 21-46. In the second match of the day Toshiba Brave Lupus beat Kintetsu Liners, featuring Rico Gear, in a try-fest that ended 50-30. With ticket prices starting from 1,500 yen, a great stadium and rising level of rugby, we’re surprised not more people take the opportunity to follow the league up close. If you want your piece of the action get in touch with the Cru who make regular visits to top league games and have been known to drop by a pub or two on the way home.